A Prince Georges County Firefighter has been found guilty of a felony in Charles County, Maryland. A Charles County Jury recently found Donald McCoy Stancell, 39 years-of-age and 14-year member of the Department, guilty of child sexual abuse. The charges stem from incidents while he was off-duty. The Fire/EMS Department initially placed Stancell, a career firefighter, on administrative duties with limited public contact status. His administrative duties began in January 2016 when he was initially charged with the crime. After being found guilty he was placed on Annual Leave pending an internal review for additional personnel actions. Stancell has since rendered his resignation. For additional information about this case, please contact the Charles County State’s Attorney’s Office. Just before 12:30 pm, Wednesday, November 15th, firefighters were alerted to a house fire with two occupants trapped in the 5200 block of Lorraine Drive in Temple Hills. First arriving units found a 1-story brick rambler, with basement, with fire showing from the front. Two occupants of the home were removed by firefighters and transported by medics to a nearby hospital. They each succumbed to injuries sustained in the fire a short time after arriving at the hospital. Prince George's County Fire Investigators have determined the fire was accidental and attributed to a malfunctioning electrical outlet. There were no working smoking alarms located in the house. Any family that is in need of a working smoke alarm and can not afford to purchase or install one themselves are encouraged to call 311. A firefighter will visit your home and install one in your home free of charge. A new state law aimed at reducing home fire deaths went into effect on July 1, 2013. It requires replacement of any battery-only operated smoke alarm that is more than 10 years old with a unit powered by a 10-year sealed-in battery having a “Hush” button feature – ultimately affecting more than 800,000 Maryland homes with battery- only operated smoke alarms. The effective date for this requirement to be completed by is January 1, 2018. Why is a sealed-in battery important? Nationally, two-thirds of all home fire deaths occur in homes with either no smoke alarm or no working smoke alarm, mainly due to missing or disconnected batteries. By sealing the battery inside the alarm, the unit becomes tamper resistant and removes the burden from consumers to remember to change batteries, which in turn, will save lives. These sealed-in, long-life battery smoke alarms provide continuous protection for a decade, and national fire experts with the National Fire Protection Association (NFPA) and National Association of State Fire Marshals (NASFM) recommend their use. The new Maryland Smoke Alarm Law, Public Safety Article Sections 9-101 through 9-109requires the replacement of smoke alarms when they are ten years old; (ten years from the date of manufacture). This replacement requirement is already in the adopted State Fire Code, reference to the 2013 edition of NFPA 72, Paragraph 14.4.7. It is envisioned that adding the wording in State Law and publicizing the requirement will hopefully result in the widespread replacement of older nonfunctioning or unreliable smoke alarms. The date of manufacture, while sometimes hard to locate, should be printed on the back of the smoke alarm. If no manufacture date can be located, it is clearly time to replace the smoke alarm. The new law heavily emphasizes the use of sealed-battery smoke alarms with a long life battery and a silence/hush button feature. 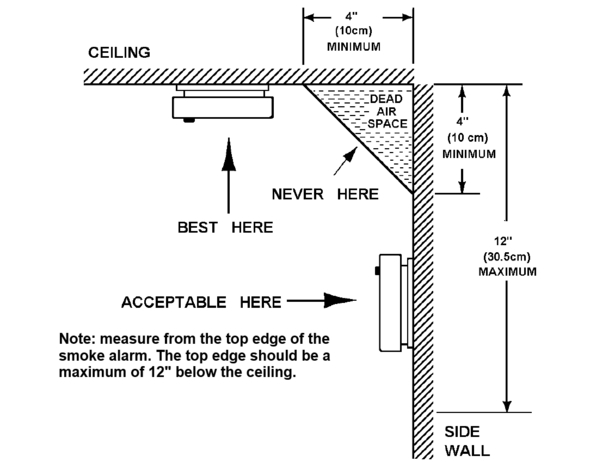 However, it is critical to understand these devices are appropriate only where battery-only operated smoke alarms presently exist or in locations where no smoke alarms are present. (It is never acceptable to remove required wired in smoke alarms and replace them with any type of battery-only operated device). A 110 volt electrically powered smoke alarm may only be replaced with a new 110 volt unit with a battery backup. Smoke alarms need to be placed on every level of the home and outside the sleeping areas, such as, the hallway accessing the bedrooms. It is also recommended to place them inside each bedroom to allow sound sleepers to be alerted if smoke begins to enter the room. Please remember to keep bedroom doors closed when sleeping to help ensure smoke, toxic gases and flames can't easily enter the bedroom allowing you more time to escape. State Fire Marshal Brian S. Geraci emphasizes the value of smoke alarms, “The importance of ensuring the proper maintenance and use of smoke alarms is paramount. The materials used in products we keep in our homes tend to burn much more readily, thus giving us a very limited window of time to escape the effects of fire. These early warning devices can be the difference between life or death in an incident of an uncontrolled fire inside our homes”. The Office of the State Fire Marshal is an agency of the Department of State Police dedicated to helping protect citizens from fire and explosion through a comprehensive program of education, inspection, investigation and fire protection engineering. For more information on fire safety call 1-800-525-3124, log onto our website at: Maryland State Fire Marshal and/or our Facebook Page. Firefighters removed an adult female from her Seat Pleasant home this morning but despite the very best efforts of everyone involved she died a short time after arriving at the hospital. At around 3:15 am, Friday, November 25, firefighters and medics were alerted to a house fire with a person trapped in the 6800 block of Wilburn Drive in Seat Pleasant. Firefighters arrived to find a 2 level, split foyer, single family home with heavy fire consuming the top level. Firefighters initiated an interior attack on the fire and searched for the female occupant. An unconscious female was located on the 1st level and removed from the structure. Medics provided CPR as well as other advanced life support measures and transported the 80 year-old female to a nearby Trauma Center. She was pronounced deceased a short time after arrival at the hospital. An adult male, 50ish years of age and son of the female occupant, was also at home when the fire started. He was able to self evacuate prior to the fire departments arrival. He was transported to a nearby hospital for smoke inhalation. No working smoke alarms were found in the house. There were 35 firefighters on the scene that had the bulk of the fire extinguished with 20 minutes of arrival. Fire loss is estimated at $150,000. Fire Investigators have determined the fire to be accidental and the origin to be in the area of the stove located in the kitchen. Two firefighters sustained burn injuries and were transported to the Burn Unit at Medstar Washington Hospital Center. They were both treated and released. The deceased has been identified as Elaine James, 80 years of age, of 6806 Wilburn Drive in Seat Pleasant. Having a working smoke alarm increases the chances of surviving a home fire by 50%. Along with having 10-year smoke alarms on every level of your home, primarily just outside of sleeping areas, placing a smoke alarm in your bedroom and sleeping with your bedroom door closed increases the chances of surviving a home fire. Plan and practice a home escape plan that identifies 2 ways out of every room in your house. Citizens that cannot afford to purchase their own smoke alarm should call 311 and ask about the Fire/EMS Departments smoke alarm program. A firefighter will come to your house and install one 10-year smoke alarm, free of charge. The homeowner is responsible for purchasing and installing other alarms required by law. Firefighters will return to Wilburn Drive this afternoon around 1:00 pm. They will go door-to-door checking for working smoke alarms and answering any questions neighbors may have about this tragic incident. If a home is found to have no working smoke alarm or one that is beyond its life span of 10 years than firefighters will install a new 10-year alarm at no cost. A working smoke alarm awakened a Clinton family on Thanksgiving morning allowing them to escape unharmed from their burning home. 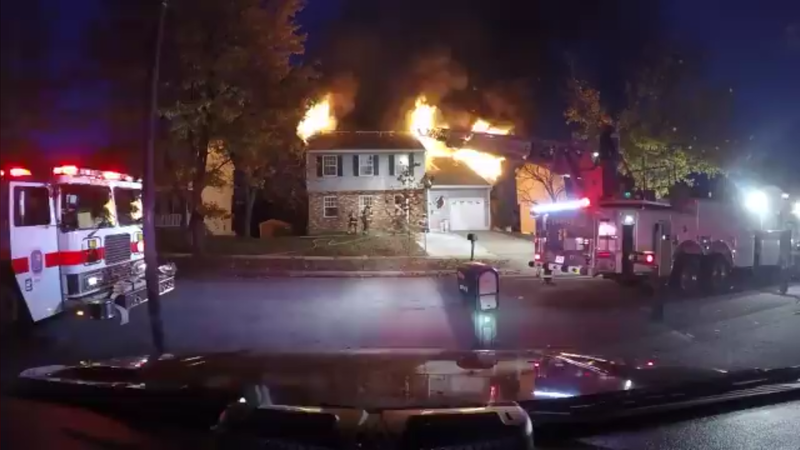 Just before 3:00 am, Thursday, November 23, firefighters were alerted to a house fire in the 8100 block of Bellefonte Lane and arrived to find smoke and fire showing from a 2-story single family structure. Firefighters extinguished the fire very quickly. The family of 3 children and 2 adults were unharmed and assisted by the American Red Cross with temporary shelter. Fire Investigators determined that combustibles on top of an exentension cord ignited causing an estimated $35,000 in loss to the contents and structure. Prince George’s County Fire Chief Benjamin Barksdale is proud to announce that Whelen Engineering has selected Assistant Fire Chief Darren O. Ware and Retired Deputy Fire Chief Tyrone N. Wells as “Everyday Champions.” The two, as well as the entire Fire/EMS Department, will be honored with a exhibit in the Whelen Hall of Champions at the NASCAR Hall of Fame in Charlotte, North Carolina. The exhibit will be unveiled during a ceremony on Friday, December 8, 2017. Both honorees and Fire Chief Barksdale will attend. For Chief Ware, Wednesday April 20, 2016, was challenging from the onset, as the Department was conducting funeral services for a member killed in the line of duty. Additionally, he was tasked with coordinating mutual aid resources and ensuring that personnel who do not work in our system or typically work together could do so safely and efficiently. Finally, upon concluding his shift and heading home, Chief Ware noticed smoke on the road ahead of him and suspected it was likely a vehicle fire. Whelen's Hall of Champions features a plaque of every winner of every single NASCAR series since its inception. Additionally, the Hall houses various items of memorabilia and several trophies. The "Everyday Champions" portion will showcase a Prince George’s County, Maryland, Fire Department/Emergency Medical Services (EMS) uniform, portraits of Ware and Wells, a panel with short biographies, and the news story and other related news images. The display will be up for one full year, after which the portraits and a brief description of their act of heroism will be placed permanently on the wall. As he neared the incident, Chief Ware’s suspicion of a vehicle fire was confirmed. He was surprised, however, to discover an adult female driver still inside. After contacting Public Safety Communications for resources, he attempted to remove the victim from the vehicle. His efforts were unsuccessful, as all four doors were locked. The woman was unresponsive to his instruction to open the door. With the fire beneath the vehicle was growing larger and progressing into the free burning phase, Chief Ware realized the increasing urgency of the situation. He hurriedly returned to his vehicle, surveying the immediate area and hoping to find an object suitable to force entry into the SUV. Things were happening quickly, but to Chief Ware it seemed like an eternity in the face of the life-threatening situation confronting the victim. Retired Fire/EMS Department Deputy Fire Chief Wells, also was travelling in the area, spied the incident and stopped to assist. A construction tool belonging to an unidentified bystander was used in a second attempt to access the SUV. Forcible entry was in progress when the victim inadvertently stepped on the gas pedal, driving the vehicle down the slope and off the shoulder of the road. The fire was now at an awkward angle with extension into the engine compartment, posing greater peril to an already stressful situation. The SUV’s new position had rendered the driver’s side inaccessible. It was imperative to affect this rescue immediately or prepare for a tragic outcome. Chief Ware and Deputy Chief Wells, with the bystander’s help, managed to get down the slope and access the passenger side of the vehicle. The American Legion, Department of Maryland, Inc.
Southern Maryland District Career Firefighter of the Year, Southern Maryland District Council The American Legion, Department of Maryland, Inc.
Congratulations, Assistant Fire Chief Ware and Retired Deputy Fire Chief Wells! Your actions reflect well on you personally and professionally and exemplify the excellent caliber of service we strive to provide to the residents of Prince George’s County. On Monday, November 20, 2017 firefighters responded to a report of a house fire in the 9200 block of McHenry Lane in Lanham. Fire/EMS units arrived to find fire coming through the roof of this 2-story single family home. The family of 5 adults and 2 children made it out of the house safely. It was determined that a damaged chimney allowed extension to the attic area of the house eventually burning through the roof. Fire loss is estimated at $100,000. Fortunately no civilian or firefighter injures were reported. 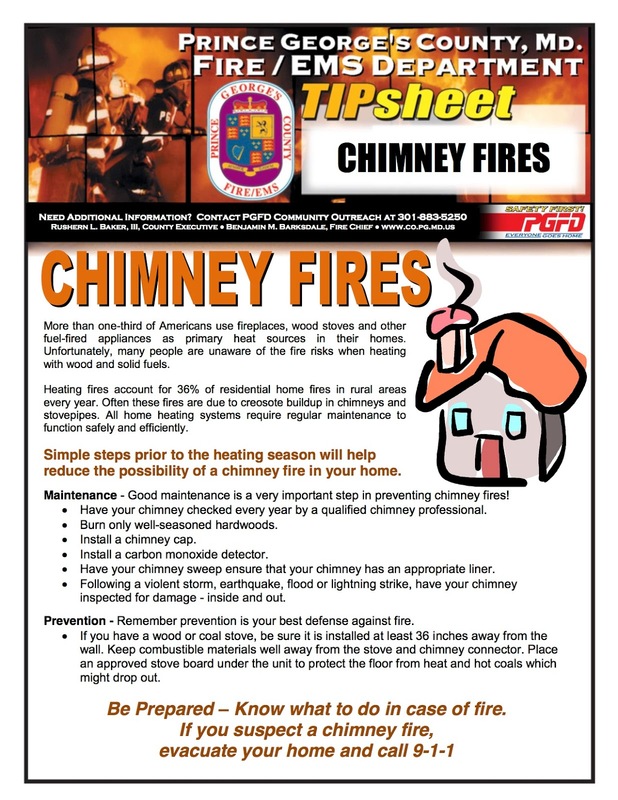 Please follow these safety tips and have your chimney/fireplace and all heating equipment checked annually by a reputable and certified company. The Prince George’s County Fire/Emergency Medical Services (EMS) Department offers the following safety tips, to ensure that all citizens and residents will enjoy a safe and festive Thanksgiving holiday. Unfortunately, fire safety and injury prevention guidelines are often overlooked during the holidays. 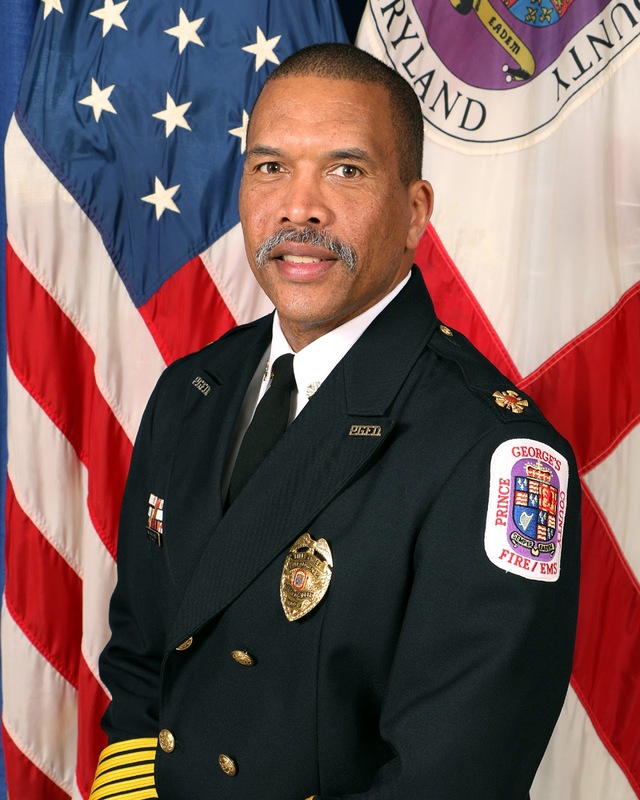 Prince George's County Fire Chief Benjamin M. Barksdale stated, "Everyone needs to keep Safety First and by doing so our citizens, visitors and businesses can avoid tragedy and disruption of their holiday festivities." The Federal Emergency Management Agency's (FEMA) United States Fire Administration (USFA) issued a special report recently examining the characteristics of Thanksgiving Day fires in residential buildings. The report, Thanksgiving Day Fires in Residential Buildings, was developed by USFA's National Fire Data Center. The report is based on 2011 to 2013 data from the National Fire Incident Reporting System (NFIRS). For each year, an estimated 2,100 residential building fires were reported to fire departments in the U.S. on Thanksgiving Day and caused an estimated 10 deaths, 50 injuries and $28 million in property loss. The leading cause of Thanksgiving Day fires in residential buildings is, by far, cooking. Additionally, smoke alarms were not present in 20 percent of Thanksgiving Day fires that occurred in occupied residential buildings. 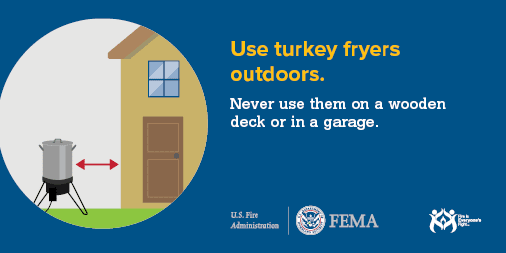 If your Thanksgiving plans include a Turkey Fryer, this is another whole story by itself, click here for Turkey Fryer Safety Tips. • Overnight guests should be instructed on your exit drill from the home and designated meeting place for your family. Sleep with bedroom doors closed. • Have a fire extinguisher available not more than 10 feet from the stove, on the exit side of the room. • A standard Class ABC multi-purpose dry chemical extinguisher is recommended. Know how to use your fire extinguisher. • Start holiday cooking with a clean stove and oven. • Keep the kitchen off limits to young children and adults who are not helping with food preparations. This will lessen the possibility of kitchen mishaps. • When cooking, do not wear clothing with loose sleeves or dangling jewelry. Clothing can catch on fire and jewelry can become entangled with pot handles, causing spills and burns. • Cook on the back burners when possible, and turn pot handles inward so they don’t extend over the edge of the stove. • Never leave cooking unattended. If you must leave the kitchen while cooking, turn off the stove or have someone else watch what is being cooked. Unattended cooking is the number one cause of home fires and fire-related injuries in Prince George’s County. According to the USFA; cooking is the leading cause of all Thanksgiving Day fires in residential buildings at 69 percent. Nearly all of these cooking fires (97 percent) are small, confined fires with limited damage. • If you use a deep fryer, please, exercise extreme caution and follow manufacturer instructions. 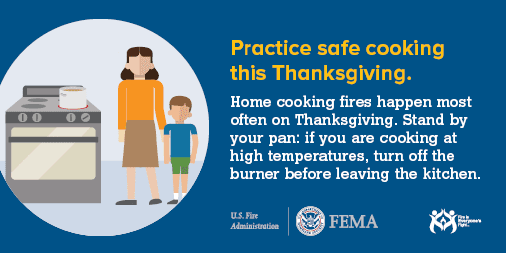 The report from the USFA found that these cooking devices accounted for about 1% of Thanksgiving Day fires. • Keep Thanksgiving decorations and kitchen clutter away from sources of direct heat. • Candles are often part of holiday decorations. The Fire/EMS Department strongly encourages the use of battery powered candles and discourages the use of candles with an open flame. If you use candles; they should never be left burning when you are away from home, or after going to bed. Candles should be placed where children will not be tempted to play with them, and where guests will not accidentally brush against them. The candleholder should be completely non-combustible and difficult to knock over. The candle should not have combustible decorations around it. • If smoking is allowed inside, provide guests with large, deep ashtrays and check them frequently. After guests leave check inside, under upholstery, and in trash cans for cigarette butts that may be smoldering. • 10-year smoke alarms will soon be required on every level of your home, in hallways just outside of sleeping areas and in every bedroom. Sleep with your bedroom door closed and test smoke alarms on the Safety First Day of every month. Working smoke alarms are required in all residences in Prince George's County. Consider upgrading to a 10-year tamper proof with hush feature smoke alarm and never change a battery again. The 10-year alarms and placement in your home will become law effective January 1, 2018. If you can not afford to purchase an alarm you can call 311. A firefighter will install a working smoke alarm in your home; free of charge. The men and women; volunteer, civilian and paid, of the Prince George's County Fire/EMS Department wish everyone a Happy and Safe Thanksgiving!!! Firefighters removed 2 occupants from their burning Temple Hills home on Wednesday afternoon. Just before 12:30 pm, November 15th, firefighters were alerted to a reported house fire with two occupants trapped in the 5200 block of Lorraine Drive. First arriving units found a 1-story brick rambler, with basement, with fire showing from the front. Two neighbors had attempted entry into the structure to assist the occupants, initially at the front door and then the rear door but each time they were forced to retreat due to high heat and thick smoke. Another neighbor called 911 and provided valuable information as to the possible location of the occupants. This information was relayed to responding firefighters by dispatchers. First arriving crews initiated a simultaneous search for the trapped occupants and stretched hose lines into the structure to extinguish the fire. An adult female and adult male were quickly located and brought to the exterior where medics initiated treatment. Both patients were found to have no pulse and not breathing and quickly transported to a nearby hospital while life support measures were being administered. The fire was extinguished within 12 minutes. Tragically, despite the very best efforts of firefighters, medics and hospital staff both patients succumbed to injuries a short time after arriving at the hospital. While we will await confirmation from the Medical Examiner of the identity it is believed the deceased are the normal occupants of the house: a female, 80ish years of age, and her son, 60ish year old male. Two of the first arriving firefighters sustained 2nd degree burns to a small area of their body. Both were taken to the Burn Unit at Medstar Washington Hospital Center. The firefighters were treated and released. Fire Investigators believe the fire originated in the basement and extended to the first floor. Fire loss to the structure and contents is estimated at $80,000. The status of a smoke alarm and exact cause of the fire is undetermined. Firefighter/Medics will return to the community Thursday morning around 10:00 am going door-to-door and asking if they can check on residents smoke alarms. If they find an alarm not working or none present they will install one for them free of charge. Any Prince George’s County resident can call 311 and ask for a similar service. On January 1, 2018, a law will require that all homes in the County that use a battery operated smoke alarm to upgrade to a 10-year smoke alarm on all levels of their home and inside every bedroom. Current law only requires 1 smoke alarm for the entire house.